Find out what our experts have to say about Suzuki Access 125! The least priced variant is Suzuki Access 125 Disc priced at Rs. 66,493 and the most priced variant is Suzuki Access 125 Special Edition Disc CBS priced at Rs. 75,000. Choose the Suzuki Access 125 which fits the bill of you. Suzuki Access 125 sits at the top of 125cc scooters in India in terms of sales and its throne has been intact for last few years. The scooter finds over 40,000 new homes every month and its plush ride quality, refined engine, and generously accepted design are some key reasons behind its selling prowess. One of the oldest 125cc scooters on sale in India and the popular Honda Activa 125’s prime rival, the Access 125 offers some interesting features including semi-digital instrumentation, DC socket, optional front disc brake and more. Suzuki Access 125 looks significantly different than the competition due to its retro-inspired design and styling that certainly works in its favour. The Suzuki Access 125 is currently available for sale in two versions out of which one is standard and the other is the special edition. While the standard version comes in three variants, the SP edition is offered in two trims. Suzuki Access 125 price in India starts at Rs 55,666 (ex-showroom) and is available for sale in six colour options. The scooter primarily challenges the likes of the recently launched Hero Destini 125 and the Honda Activa 125. The scooter is offered with 2 years / 24,000 km warranty in India whichever comes earlier. One of the key reasons behind the popularity of Suzuki Access 125 is its design. The Access 125 gets a retro look that is quite rare in a scooter of this segment in India. The front end of the scooter gets a squarish headlamp enclosed in a chrome bezel that looks premium. The special edition model gets chrome rear view mirrors that enhance the appeal further. The scooter gets a longer floorboard that facilitates ease of riding and offers convenience. The scooter offers tubeless tyres and these are mounted over stylish alloy wheels that enhance the overall style quotient of the scooter. Talking of rear, the scooter gets chrome exhaust muffler along with a stylish tail lamp and these elements act as other highlights in terms of visuals. The scooter tips the scales at 102 kg and has a 5.6-litre fuel tank. Overall, the design looks retro and modern at the same time but it has not been updated since long, due to which you can see an updated Access 125 in the coming months. Suzuki Access 125 gets power from a 124cc, single cylinder, air-cooled engine that is good for shedding out a maximum power of 8.7 bhp while the peak torque output is rated at 10.2 Nm. All thanks to Suzuki Eco Performance (SEP), the company claims a fuel efficiency of 64kmpl for the scooter. With this hardware, the Access 125 can achieve a top speed of 92kmph. The engine is BS-IV compliant and gets an electric start for ease of starting. The refined engine has a decent low-end torque due to which daily commutes are easy and hassle-free. Suzuki claims that the scooter returns a fuel efficiency of 62kmpl which is class-leading. The Suzuki Access 125 has been equipped with drum brakes at both ends and a front disc brake is offered as optional for better stopping power and safety. The set up is further linked to a combined braking system to offer added safety and convenience as it reduces chances of skidding. The scooter rides on 90/90-12 front and 90/100-10 rear tubeless tyres that offer convenience in case of a puncture. The suspension system of the Suzuki Access 125 comprises of conventional telescopic forks up front along with a rear monoshock. The scooter is easy to handle in traffic and on feels confident on corners too due to which it is a good option for daily commutes. Suzuki Access gets an optional front disc brake that offers an enhanced stopping power when compared to the conventional drum units. The vehicle also comes with AHO (Auto Headlamp ON) function and as the name suggests, the headlamp stays ON always in order to increase the visibility of the scooter, thereby minimising chances of a mishap. 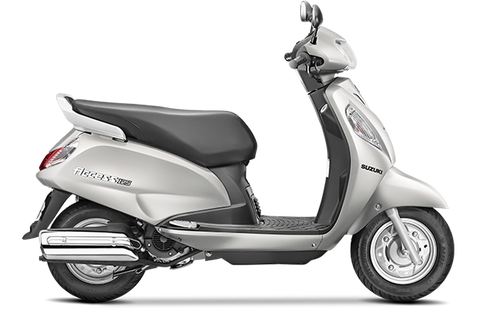 The scooter offers a safer and precise braking as it comes with a combined braking system that ensures minimum chances. In terms of features, Suzuki Access 125 gets some interesting ones like mobile charging provision, shutter lock, front pockets, alloy wheels and more. © Copyright © Gaddi 2014-2019. All Rights Reserved.